Custom Cabinetry – Kitchens by QBI offers a variety of upscale kitchen cabinet lines to satisfy every homeowner style and budget. 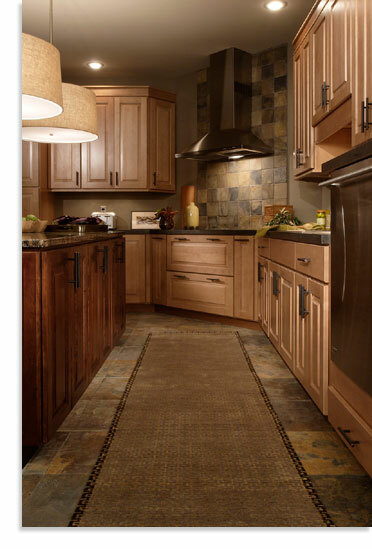 With over 300 options, you will be sure to find the perfect cabinet style, wood treatment, and finish to complete the transformation of your kitchen. Classic Granite and Tile Countertops & Backsplashes – We partner with several world-class granite, marble, quartz and tile companies to bring you the kitchen counter and backsplash designs and surfaces to easily meet your lifestyle. Stylish and Resilient Tile and Wood Flooring – If there’s one room that sees more traffic than any other in our homes, it’s the kitchen. QBI provides you a wide selection of kitchen flooring that combines durability – for that high traffic – with the beauty – for this focal point of your home. Distinctive Faucets, Fixtures and Sinks – Kitchens by QBI delivers you a complete line of faucets and fixtures for your kitchen renovation, as well as diverse styles of sinks crafted from various materials, including stainless steel and cast iron. If you’re looking for a new bathroom design for your master bath or powder room, a new bathroom suite, or simply a new whirlpool bath, QBI will work with you to arrange the perfect space for you and your family… a bathroom that combines elegance with convenience. Crafted Bath Vanities, Mirrored Cabinets, and Other Bathroom Furniture – QBI supplies a varied line of custom cabinets for your new bath space. From floor to ceiling cabinets for optimal storage… to mirrored cabinets above your pedestal sink, we’ll work with you to plan the bathroom furniture – from the style… the wood... to the finish – that’s best for your new bathroom. Luxurious Bath Showers and Tubs – After a long day at work or shuttling around your children, a long, hot bath or a steam shower sounds glorious. Let QBI create your perfect bath spa experience, including your whirlpool or air bath… or your new personal shower system, including showerheads, body sprays, rain heads, digital showering, or hand showers. Tile, Wood or Cork Flooring – Kitchens by QBI also supplies a wide selection of flooring for your new bath. We’ll incorporate the need for durability (including a necessary resistance to moisture) with your strong desire for beauty. Whether it be exquisite tile options, cork or wood flooring, QBI works with you to find the best material for your desired bath experience. Distinctive Faucets, Fixtures, Toilets and Sinks – We offer you a complete line of faucets and fixtures for your bathroom suite, as well as various styles of sinks. These include pedestal sinks, countertop, and above- or under-counter installation sinks, fashioned from various materials, including marble and granite, in a wide range of colors and styles… all to withstand heavy usage. We can’t say it enough: Kitchens by QBI is a full service home renovation specialist. And we’re your partner throughout that remodeling. We can even order your new appliances for you. And if you have another room you would like to make-over – a new office space or your family room for that new entertainment center you just purchased – Kitchens by QBI has the plan you’re looking for… for the price you need. Learn more about these companies and the first-rate products you can receive for your home remodeling project. You can also see for yourself the quality and sophisticated renovations we’ve delivered for our valued customers. Visit the Kitchens by QBI photo gallery here. With over, 1,000 transformed spaces, Kitchens by QBI knows how to focus on all the details of your home renovation to deliver the quality you're seeking. And that's just a few of the comments customers of Kitchens by QBI have offered. Now it's your turn to transform your home. Begin your journey with your FREE In-Home Consultation. Our experienced designer will visit you in the convenience of your home to discover your needs and desires for your new space. Then he’ll incorporate your ideas with our experience for the most functional kitchen or bath for your lifestyle. Using the latest computer technology, we provide you with layouts, floor plans & 3-D views of your new kitchen or bathroom, so you can see your ideas become reality before construction actually begins. Contact Kitchens by QBI now for your FREE In-Home Consultation. Call us at 410-848-4974, or contact us via email.